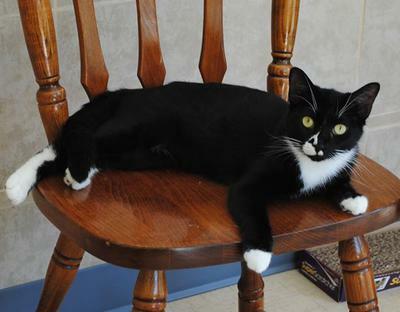 We are a new shelter in Hiram, ME that provides a safe haven for cats who are FeLV+. We have a big fundraiser scheduled for November 2 in Ogunquit, ME. It is Maine CATstravaganza, A Fashion Show with a Catty Twist. 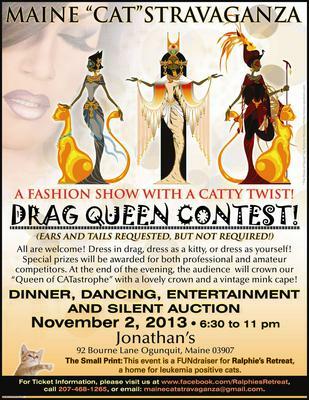 This is an evening of fun, with dinner, dancing, music, and a drag contest. We are asking folks to help spread the word about this event. The event poster is attached. Please help spread the word, and don't forget to buy your tickets! Go to www.facebook.com/ralphiesretreat and click on the Catstravaganza event. Let your friends know by sharing the event invitation. SILENT AUCTION IS LIVE AT FACEBOOK!! Some great items on there, including kitty neuters and vet care at 3 vet clinics in Maine, an overnight stay at a nice inn in Ogunquit, Mimosa breakfast in Bridgton, and LOTS more. Please visit and place your bids!